I really loved this wonderful novel! I admit I had a hard time getting into it, but once I did, I found myself so emotionally taken. I started this on a trip, which seemed fitting as the story is of a journey on the steam liner Oronsay. But I had trouble reading The Cat’s Table in short bursts. This is a book to which you must give yourself over—to read leisurely and to savor. Michael Ondaatje does not write with a melodramatic style, but, oh, did I ache for these characters. We also get a glimpse at the magic of Sri Lanka, with its “chorus of insects … gecko talk. And … rope burning on the street that was always one of the first palpable smells of the day.” Though Ondaatje is not a magical realist, he certainly evokes that sense of finding magic in the ordinary, the quotidian. As the trip progresses, we get to know the characters not only from their interactions on the Oronsay, which is a bit like a small town, but also through flash-forwards and flashbacks. (It reminded me of LOST in the way a certain scene accrues different meanings and emotions when seen via another character or the veil of time). Check Out WordHits on Facebook? Or Follow @WordHits on Twitter? I do have an e-reader, but still mostly like to lug around the real deal. 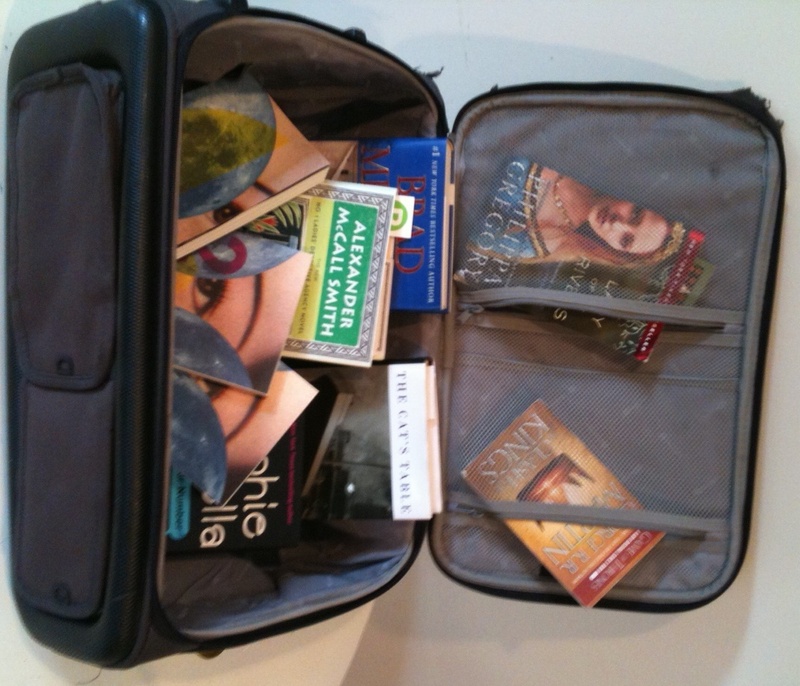 Now that everyone has Kindles, Nooks, and iPads, it’s much easier to bring books on a trip. But the question remains … exactly what to read? I find that my book tastes change dramatically when I am on the road—trending towards escapist and the potboiler. Last weekend, I brought 1Q84 (well, volume 1) to my college reunion. Let’s just say that Murakami is extra trippy after a late night out. I quickly had to put that aside in favor of (gasp) Brad Meltzer’s faux history thriller The Inner Circle. (Full disclosure, I only lasted about 50 rather dreary pages in this before I quickly flipped to Phillipa Gregory’s engrossing The Lady of The Rivers.) It’s not that I wasn’t enjoying 1Q84—so absorbing and intense—but I find it harder to read (and to appreciate) literary fiction in snatches. I get that feeling that I’m missing something. I also tried to read The Cat’s Table, by Michael Ondaatje during my travels, but I couldn’t really get into it until I was home for a few days. Loved it, by the way! Ondaatje’s writing (like that of Murakami or, say, that of Gabriel García Marquez) is so dense, so beautiful—these are words you want to sink into with a chunk of time. Plus there’s something about travel that makes me crave book candy: chic lit, suspense, or cozy fiction. Basically, I pack books with short, episodic chapters, and (mostly implausible) page-turner plots. Or, I turn to humor. I breezed through the most hilarious e-book spoof, A New Financial You in 28 Days (A 37-Day Plan) on my iPhone. Also, anything by Sophie Kinsella or P.G. Wodehouse makes excellent road-trip fare—especially on those long-haul flights. I was once stuck on the tarmac at DFW for nearly an hour AFTER landing, but barely noticed because I was deep into Right Ho, Jeeves. I think it’s the stress and discomfort of travel—overcrowded planes, arduous delays, and the fatigue of packing and unpacking—that make me want something indulgent. It’s sort of a bookish equivalent to chocolate, a glass of wine, or a bubble bath. ‘Airport Lit,’ is what Dominique Browning dubs it in a humorous essay for the New York Times. She goes on to describe the sisyphean agony of trying to get through Ulysses while her plane was repeatedly deiced at the gate. Things got much better once she picked up G.R.R. Martin. The hassles were still there, but she no longer cared. On the other hand, great writing (and thus great literature) tends to stir one up, making you more viscerally aware. That’s not necessarily ideal on a bumpy flight when the people next to you are arguing over the armrest. Hahaha. Loved this e-book—silly, funny, clever. Perfect kindle or smartphone read for when you are stuck in the airport. Addictive—biblio crack. This is epic storytelling with such memorable characters. Note: beware of GRR Martin books when changing time zones … they will keep you up all night! So fun and hilarious! Not only did I laugh out loud, I dropped the book. It’s right up there with her original Shopaholic books—most genius chic lit. Alas, this is supposed to be a thriller about secrets passed down by US Presidents. As much as I balk at dissing books, I must say this was a giant snoozer of a disappointment. Nothing remotely exciting happened for the first 50 pages except the narrator whining (seriously whining) about how he was a geek in high school. Who cares?! The geeks rule the world now. Anyway, finally around page 52 someone dies, and the main character’s reaction was so histrionic (comic) that I could not take it, or the book, seriously. Chilling pot-boiler, this is not. More frothy fun and a bit of bodice-ripping as Gregory, known for her Tudor Court Novels (‘historical’ fiction) now turns to the Wars of the Roses. I highly suggest reading this prequel first of the four books in the Cousins’s War Series, as it really explains and lays a groundwork of understanding for what became an infamous period in English history. I just LOVE all the No. 1 Detective Agency novels. The latest is simply delightful, like a cheering cup of bush tea—charming, heart-warming, and everything always turns all right in the end. How About Liking WordHits on Facebook? Or Following @WordHits on Twitter?